I was just chatting with another mom about how we’ve mentally and emotionally checked out of school. We’re done. It was so gorgeous outside tonight, and the girls were having such fun, again, that it just kills me to make them come inside and go to bed. Especially since there’s not too much actual learning still going on at school, anyway. M’s still busy on her New York State Spotlight project. She’s been learning about Ellis Island. She has two great, great grandfathers who went through Ellis Island, and on the site you’re able to look up their information, including details on whatever ship they sailed. 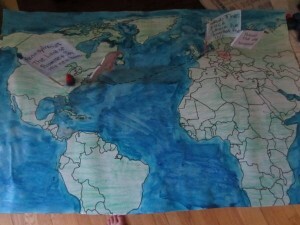 As part of the project, she made a map, marking spots on the immigration journey. After reading all those kids’ books about Ellis Island she’s learned a decidedly rose-colored version. She’s labeled the final flag: “Pennsylvania: Land of Promise and Joy, His New Home.” Every time I see it, I have to repress a snicker. Because he went to Pennsylvania to become a coal miner. Granted, his grandson ended up with an MBA and a golf cart, so yeah, okay. Promise. But I am a little skeptical on the Joy front. When she’s not working on the school project, M’s coming up with independent projects. Can you tell what this is? It’s a door! This is the door-less doorway down to our basement playroom. 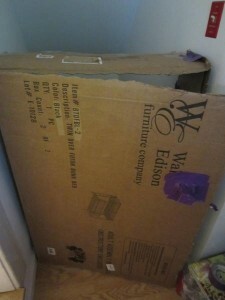 So M and J created a door with a big ol’ box. That blob of purple is a duct-tape doorknob. 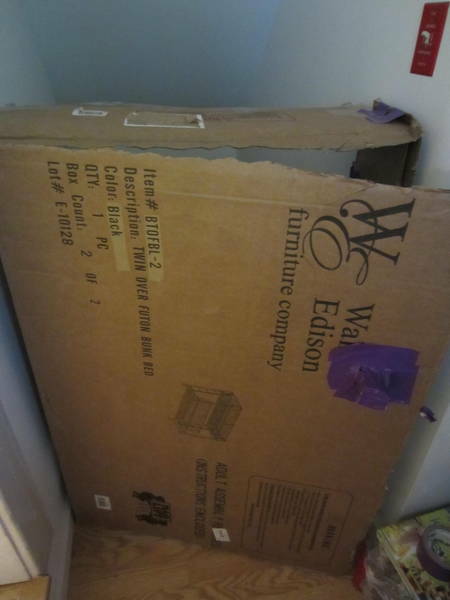 We happen to have quite a bit of cardboard at our house because both girls have recently acquired new beds. J’s bed was literally falling to pieces. Pieces would break off while we were reading stories. Meanwhile, M had been admiring a loft-style bed that she ended up requesting for her upcoming birthday. That bed is still a work in progress, but J’s got set up in time for it to be used as a guest room when my parents came to visit. During the visit, my mom said, “Katie, you’ve got to take a picture of those girls’ rooms.” She’d mentioned this before, but it’s a good suggestion, really. I took pictures of the baby’s nurseries when we were waiting for them, but once the girls got older, it seems rare that the rooms are tidy at exactly the same time that I think of taking a photo and have a camera. So as soon as they left and we moved the extra mattress away, I took some photos of J’s room and her new bed. Our cat Isis decided that she should be in the picture, too. Anyway, I thought it was good advice worth sharing. Because these kids evolve when we’re not looking. And, incidentally, so do their rooms. So grab a memory, everybody! It’s off-topic, but I just heard about Kids Skate Free, where you can register kids 12 and under for free admission for skating at Rollarama in Schenectady or The Fun Spot in Queensbury. It’s for certain days and times and skate rental isn’t included, but it’s still worth signing up, right? For those days, you know, when you’re not bowling for free. 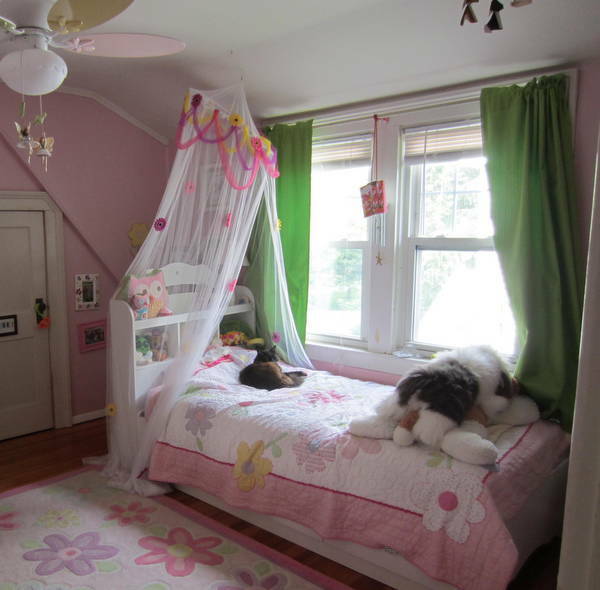 That bed frame is awesome – can I ask where you got it?